Service is about the intentional and dynamic configuration and interaction of the service provider’s and the service consumer’s resources (in the broadest sense of the word). In an IT service context, IT service is all about the underlying IT service resources such as applications and infrastructure are configured and how they interact, together with people and organization, partners and suppliers. 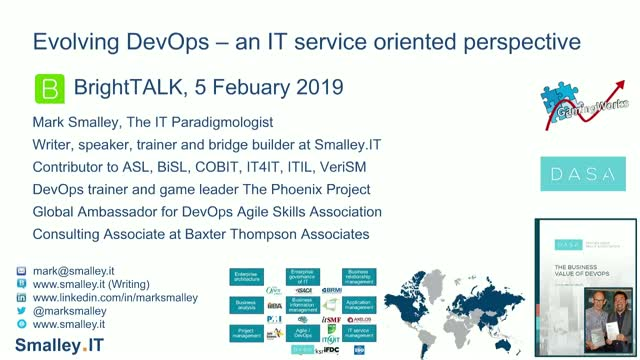 You can’t actually do anything with IT service apart from define it and provide it – if you want to do anything substantive, you have to act on the underlying applications and infrastructures. DevOps is about doing substantive things to and with applications and infrastructure. Contributing to the emergence of IT service when all the stars are aligned. The stars need to be aligned because of all the other disciplines (and often organizational entities) that also play a role. Using these concepts gives you a better grip on who is (probably) responsible for what, enabling you to establish a better working relationship.